bebop spoken here: Christian McBride Big Band @ Cheltenham Jazz Festival, Town Hall – May 6. 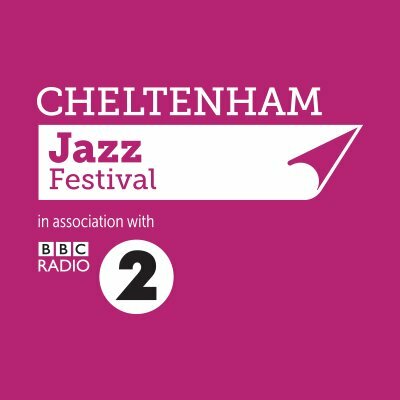 Christian McBride Big Band @ Cheltenham Jazz Festival, Town Hall – May 6. I had their album Bringin’ It as one of my picks of last year; an unlikely choice from a self-confessed big band philistine, but I saw McBride with his trio in November and if anybody can make a big band cool it's him. The start had a stand-in on bass allowing a big introduction for the leader; apparently common-place in such situations. The band were all in white shirts, perhaps reflecting the weather outside, but McBride remained in a suit throughout. Trumpet solo followed by Marcus Strickland on tenor, backed by the rest of the horns, followed by trombone, the audience now clapping along, before muted trumpets provided the backing with a short bass burst finishing the piece. Getting to It he confided was a reworking of James Brown Get it Together, also taken from the Bringin’ It album, as is Youthful Bliss which followed it, featuring solos on soprano and bass. Texas trumpeter Brandon Lee, formerly with Archie Bell and others, (and soul and funk seemed to be a thread through McBride and the band), pretty much played I Thought About You before Thermo, a Freddie Hubbard piece, written while he was a Jazz Messenger, featured solos on trumpet, tenor and piano. Both pieces are on the album. The band was then joined onstage by Melissa Walker who sang Herb Albert's Taste of Honey (I think) followed by, what he described as an old American folk song, Mr Bojangles. She's a fine singer but the vocal tracks are my least favourite on the album. In the Wee Small Hours (on the album) played in the key of B, which apparently makes it very difficult, - attracting charges of crazy string player from brass players - had the leader playing the melody with bowed bass, backed by three flutes. He then announced he was going to play some of the dirty F-word funk, claiming hard-core jazzers appreciate it because jazz already has some funk in it. Of course it does, and funk has lots of jazz in it. George Duke, he announced, was a big influence and mentor and they played his Black Messiah pt 2, speculating it refers to Cannonball Adderley. It featured heavy, pounding bass, solid drumming, lots of piano and a first baritone solo. I say first but it may also have been last as many, myself included, left for Kamasi Washington at the Big Top, just as Melissa returned to the stage, presumably for Upside Down from the album. That'll teach them to start late. I'm reliably informed the bass player who played during McBrides intro was James Owston of Birmingham Conservatoire and can be seen on the photo at the end of the Rob Luft review.